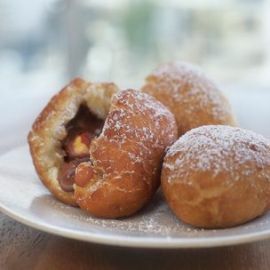 Sweet fritters, called zeppole, are found all over Italy, from cream-filled pastry puffs in Lazio to pine nut spheres in Emilia-Romagna to brandy-flavored rounds in Abruzzo. Here, a chunk of chocolate and a hazelnut are enclosed in each doughnut-like puff. For a special treat, serve the fritters with hot chocolate on a cold day. Position a rack in the middle of an oven and preheat to 325°F. Spread the hazelnuts in a single layer in a small baking pan and toast in the oven, stirring once or twice, until fragrant, the color deepens, and the skins begin to crack and loosen, about 10 minutes. Transfer the nuts to a towel and rub firmly to remove the skins. Not all of the skins will come off. Set the nuts aside to cool. In a large bowl, whisk together the flour, baking powder and salt. In a separate bowl, whisk together the egg and granulated sugar until thick and creamy. Beat in the milk and melted butter until combined. Pour the liquid ingredients over the flour mixture and stir with a wooden spoon just until blended. Pour the oil to a depth of 3 inches into a deep, heavy fry pan and heat to 370°F on a deep-frying thermometer. Line a baking sheet with paper towels and set it next to the stove. When the oil is ready, scoop up 1 rounded tablespoonful of the dough and press a piece of the chocolate and a hazelnut into the center. Then, with a second spoon, shape the dough over the filling to enclose it completely. Gently push the dough off the spoon into the hot oil, being careful it doesn’t splash. Repeat to make a few more fritters, but do not crowd the pan. Fry the fritters, turning them once, until nicely browned, about 2 minutes. Using a slotted spoon, transfer the fritters to the prepared sheet to drain. Shape and fry the remaining fritters in the same way. Transfer the fritters to a platter. Using a fine-mesh sieve, dust them generously with confectioners’ sugar. Serve warm.